It’s nearly fall, and so begins a new round of outdoor activities, festivals and other fun in Reston. Here are a couple of things happening this weekend. ChalkFest — Beginning mid-day Friday, Market Street will turn into a colorful row of chalk murals at the second annual ChalkFest at Reston Town Center. Professional artists will get started today, with the 4-by-8 foot spaces opening up to amateur artists, including children, on Saturday. 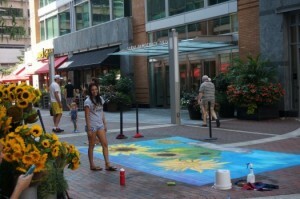 The event is sponsored by and will benefit the Initiative for Public Art Reston (IPAR). There still may be room to register in your division. Visit the ChalkFest website. Reston Association’s Community Yard Sale — RA’s annual sale includes 95 tables of household goods, baby items, toys, and other things for bargain shoppers, Vendor tables are sold out, but hundreds of shoppers are expected. Sale is in RA Headquarters parking lot (12001 Sunrise Valley Drive) from 8:30 a.m. to noon. Get there early for best selection. Diving Dogs — The Chesapeake Dock Dog Diving Club returns to Lake Anne Plaza for a free demonstration. The trained dogs perform extreme leaps and jumps, landing in the lake. The event is sponsored by Lake Anne Plaza’s PetMAC, which will also have animal rescue groups and animals for adoption on hand. The event runs from 1 to 4 p.m.